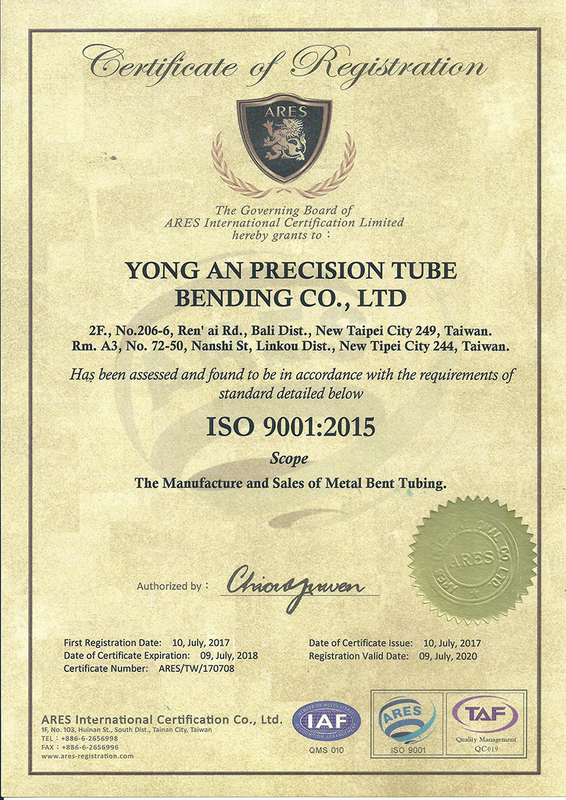 Underpinned by its motto “Customer Service and Quality First,” Yong An Precision Tube Bending Co., Ltd., formerly known Ho Cheng Bent Tube Corp., is a specialized tube and pipe manufacturer with a history of 32 years, well recognized by Taiwan’s National Chung-Shan Institute of Science and Technology, and domestic carmakers and semiconductor firms as a qualified supplier. ong An employs a spate of CNC and NC machinery to achieve automated production, hence greatly lowered cost and enhanced efficiency. The company provides bending, expanding, shrinking, stamping, end forming services for various pipes and tubes, fittings, as well as pipe and plate punching, argon welding and welding, and mold and die developing, with abundant experience and consummate techniques. Inquires are sincerely welcome. Bent pipes & tubes and punched parts for automotives, motorcycles, builders’ hardware, furniture, medical devices, etc. Automotive parts and pipes; motorcycle parts and pipes; punched parts; end forming; fittings; furniture tubing; bicycle pipes; processing of tubes and pipes of iron, aluminum, steel and stainless steel; pipes and fittings for chairs; metal-tube K/D furniture; metal-tube furniture; bathroom fittings and piping, etc. Multifunctional 9-axis CNC tube benders, NC tube benders, tube end forming machine, punching machines, welding machines, Argon welding machines, grinding machines, milling machines, drilling machines, CNC tube cutting equipment, mold making equipment, presses, leak detectors and so forth.